Posters should get conference attendees talk to the presenter. Because attendees are busy, posters must grab attention, even if a potential reader is quite a long way from the poster. Similarly, posters should make an implicit promise to the reader that the gist of the poster can be grasped quickly. Posters should also contain enough information that a person is able to read it and understand the main message. The problem here is not with the total amount of text — though that can sometimes be an issue — but with the width of the text. 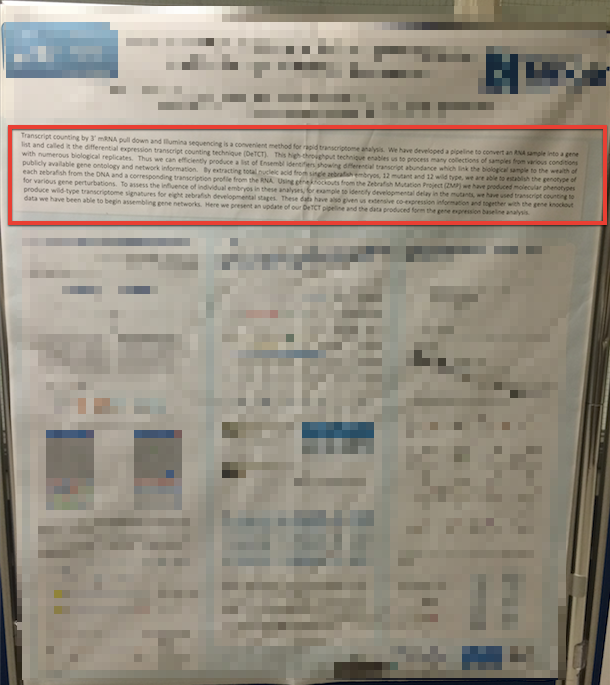 These posters are 84 cm (33 inches) wide, and it is not ideal to create text blocks that span the entire width of the poster. The reasons behind this are the same reasons why you never see newspapers display text like this…we are not very good at reading information in this manner. The ideal line length for text layout is based on the physiology of the human eye. The area of the retina used for tasks requiring high visual acuity is called the macula. The macula is small, typically less than 15 percent of the area of the retina. At normal reading distances the arc of the visual field covered by the macula is only a few inches wide—about the width of a well-designed column of text, or about twelve words per line. Research shows that reading slows as line lengths begin to exceed the ideal width, because the reader then needs to use the muscles of the eye or neck to track from the end of one line to the beginning of the next line. If the eye must traverse great distances on a page, the reader must hunt for the beginning of the next line. In contrast to the above examples, there were a couple of posters at the #UKGS2014 meeting that I thought were beautifully displayed. Bright, colorful, clearly laid out, not too much text, and good use of big fonts. Congratulations to Warry Owen et al. and Karim Gharbi et al. for your poster presentation prowess! One of the many projects I am involved with looks at Intron-mediated enhancement (IME) of gene expression. Our collaboration with Alan Rose at UC Davis has been a fruitful one, and has led to the development of computational tools that can predict how much an intron might enhance expression. The initial version of what we called 'the IMEter' was published in 2008 and an improved v2.0 version was published in 2011. The online version of this software only lets you test Arabidopsis introns…not so useful when there are now so many different sequenced plant genomes. We addressed this limitation in a new — as yet unpublished — v2.1 version which is available online. IMEter v2.1 can now test the expression enhancing ability of introns from 34 different plant species. 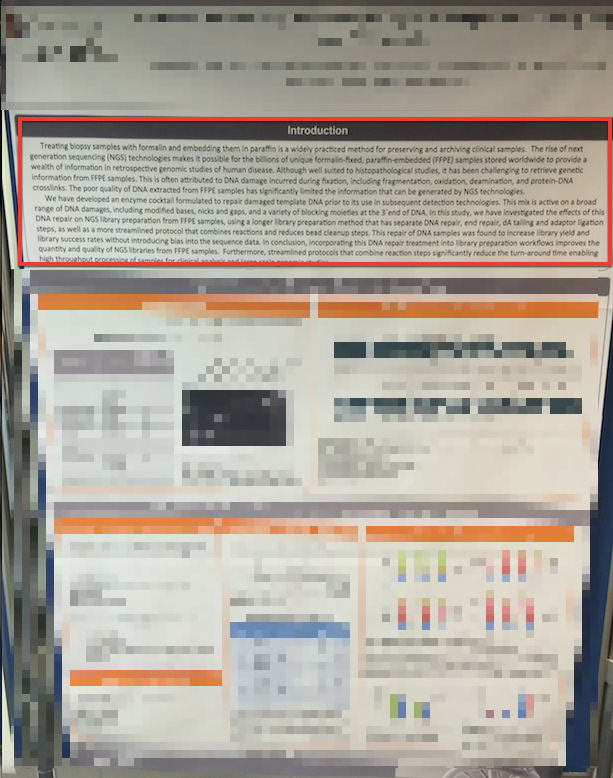 The new IMEter is the subject of my poster at the forthcoming UK Genome Sciences meeting in Oxford. The poster, available below via Figshare, explains a little more about how the new version of the IMEter came about. It also discusses some of the problems that arise in trying to adapt a software tool from working with one, very well annotated, genome, to working with many different genomes of varying quality.